I am an Independent author. I cannot be overruled by an editor. Or worse, a marketer. Because I don’t have an editor, I have beta readers. I am not simply free lance, but also independent and self publishing. The impetus for writing my debut novel was NaNoWriMo. I chose to self-publish through CreateSpace. I’ve finished crafting an eBook version I will be able to distribute for Kindle and the KOBO. And some people will assume these are signs of amateurism, because they believe independent or self published books can’t be as good as those published by a major publishing house. Having read both good and bad mainstream books I disagree. The movie industry can no more predict “good” or “successful” than the music or publishing industries can. Plenty of bad books have been published by the mainstream. In the recent past, the media giants held absolute power over the creative artists in their respective industries. The handful of people within the corporations who decided what would be published or produced became known as “gate keepers” because they keep out the riff raff and only publish “good” books. That’s the theory, anyway. But these corporations didn’t own a crystal ball and weren’t capable of transmogrifying a sow’s ear into a silk purse. So some of what they published was very very good. But an awful lot of it was horrid. The only qualification for “gatekeeper” was to own the equipment necessary to manufacture the movie/music/book and the means to get it to the audience. What the gatekeepers really did was manufacture copies and control distribution. Even good books aren’t guaranteed to sell. Vincent Van Gogh never sold a painting in his lifetime, because the art world’s gate keepers didn’t know what to make of his work. Vincent’s paintings didn’t look like any body else’s paintings. They didn’t fit in the art world’s mold — Vincent broke the mold. Sadly his work didn’t breakout until after his death. As with Vincent’s work, it can take time before anything new or different to catch on. Many factors determine whether audiences and art will come together. Timing can be a factor. Even though most of us have seen Frank Capra’s classic film “It’s a Wonderful Life,” this great film was was a box office bomb that took decades to break even. Nobody knows nothin’. Professionals green lighted Heaven’s Gate — a colossal bomb that took out a major Hollywood Studio. Gatekeepers are only human. Although these industries hire good people as professional readers, editors etc., it is always a crapshoot. J.K. Rowling’s “Harry Potter” was reportedly turned down more than once — something like 13 times. Isn’t that pretty standard? Doesn’t every published author have a stash of rejections? Because even today, nobody knows nothin’. The difference is that everything has changed dramatically. Print On Demand (POD) technology is both economical and good enough that even mainstream publishers use it. eBooks are cheaper to produce and distribute thanks in large part to the Internet. Real costs have dropped through the floor, yet the corporations pretend nothing has changed. The industries no longer control distribution. Once created, it costs next to nothing to copy a digital file. In the book industry mainstream publishers attempted to assume control of digital rights for backlist books without negotiating for them. Though costs of manufacturing digital books are nearly non existent these same publishers are fighting to keep the lion’s share of profits rather than dealing equitably with the very writers who have been making money for them for years. It never crossed my mind to even query a publisher. Rather than jumping through hoops to acquire an inequitable publishing deal by giving up control over my work, I have chosen instead to ‘self publish’. Regardless of what the publishing industry would have us believe, ‘self publish’ is no more an oxymoron than ‘self portrait’. I am not willing to rely on the lowliest member of the editorial team to convince her superiors to do their best for my book. Instead, I would rather rely on myself to do my best for my books. I’d rather publish myself and trust my readers to decide its merit. If people like what I write and choose to support my work, that would be good. I’m happy to be able to write and especially to be able to make my work available to those who would read it. And with today’s technology, I can. 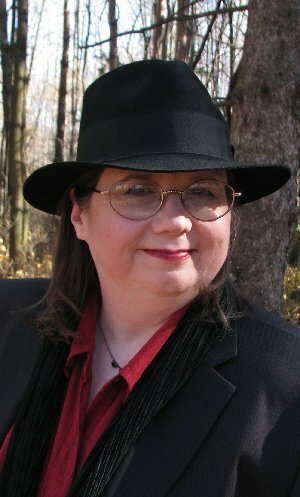 Since writing and publishing are two very different pursuits, I’ll blog about writing in my author blog, and sharing my adventures in self publishing in the Libreleft Books blog . Laurel L. Russwurm portraits by lothlaurien are licensed under a Creative Commons Attribution 3.0 Unported License. Based on work at lothlaurien.ca. 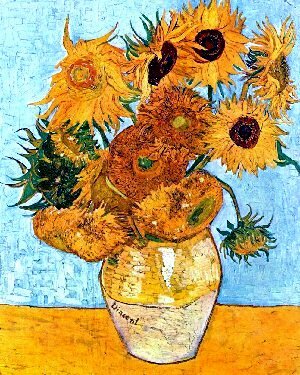 Vincent Van Gogh‘s “Still Life: Vase with Twelve Sunflowers” is in the public domain. You go girl! I am very proud of my sister. Not only is she well spoken and an excellent writer, she has an innovative creative mind that comes across in her written words.